The Northside Independent School District in San Antonio, Texas, has launched a program, the “Student Locator Project,” aimed ostensibly at increasing public funding for the district by increasing student attendance rates. As part of the pilot program, roughly 4,200 students at Jay High School and Jones Middle School are being required to wear “SmartID” card badges embedded with an RFID tracking chip which will actively broadcast a signal at all times. Although the schools already boast 290 surveillance cameras, the cards will make it possible for school officials to track students’ whereabouts on campus at all times. School officials hope to expand the program to the district’s 112 schools, with a student population of 100,000. Although implementation of the system will cost $500,000, school administrators are hoping that if the school district is able to increase attendance by tracking the students’ whereabouts, they will be rewarded with up to $1.7 million from the state government. 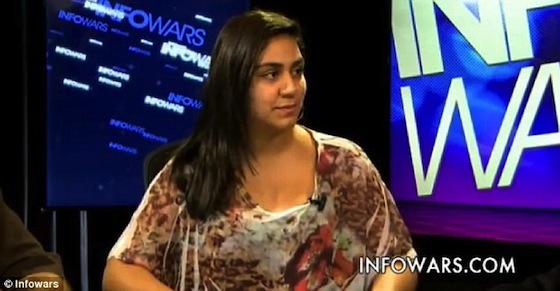 High school sophomore Andrea Hernandez, a Christian, expressed her sincere religious objections to being forced to participate in the RFID program. Reportedly, Hernandez was informed by school officials that “there will be consequences for refusal to wear an ID card.” For example, students who refuse to take part in the ID program won’t be able to access essential services like the cafeteria and library, nor will they be able to purchase tickets to extracurricular activities. Hernandez was prevented from voting for Homecoming King and Queen after school officials refused to verify her identity using her old, conventional student ID card. According to Hernandez, teachers are even requiring students to wear the IDs when they want to use the bathroom. School officials offered to quietly remove the tracking chip from Andrea’s card if the sophomore would agree to wear the new ID without the imbedded RFID chip so as to give the appearance of participation in the Student Locator Project. Andrea refused this offer. CBN Reports: A judge has told the Texas high school it cannot remove a student because she refused to wear a “Smart ID” tracking badge. John Jay High School‘s Science and Engineering Academy requires students to wear badges with tracking chips in them. 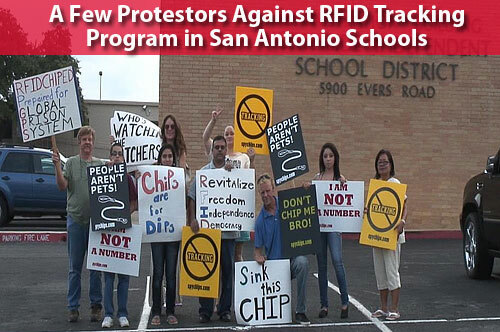 Meanwhile: The ‘hacktivist’ group Anonymous has claimed responsibility for taking down the website of a San Antonio’s Northside Independent School District in retaliation for requiring students to wear badges with Radio Frequency Identification (RFID) chips. The website for San Antonio’s Northside Independent School District was unavailable at times throughout the weekend and into Monday, reports RT.com. It appears that such RFID student tracking systems are becoming an actual market. The systems are popularly known as “Tag and Track,” are being sold to schools system across the country by a variety of vendors, including AIM Truancy Solutions, ID Card Group and DataCard. Houston, it turns out, has had such a RFID system deployed since all the way back in 2004. Austin also has a program, but it is not mandatory. Baltimore’s school system has also deployed a system, and the Anaheim district is testing the system. The Palos Heights School District in Illinois has implemented the program with RFID tags attached to a student’s back pack. How widespread these student tracking systems beyond these and a few others is not clear. Beyond tracking in the schools, the technology allows a school district, for example, to send automatic “wake-up calls” to students not found to have made the opening bell – but some are taking the systems even further, generating fears from some about the reach of these systems. For example, on Long Island, NY, Bay Shore students designated overweight or obese are being equipped with a wristwatch-like devices that count heartbeats, detect motion and even track students’ sleeping habits. Wow. Brace yourselves for the next wave in the surveillance state’s steady incursions into our lives. It’s coming at us with a lethal one-two punch. To start with, there’s the government’s integration of facial recognition software and other biometric markers into its identification data programs. The FBI’s Next Generation Identification (NGI) system is a $1 billion boondoggle that is aimed at dramatically expanding the government’s current ID database from a fingerprint system to a facial recognition system. NGI will use a variety of biometric data, cross-referenced against the nation’s growing network of surveillance cameras to not only track your every move but create a permanent “recognition” file on you within the government’s massive databases. By the time it’s fully operational in 2014, NGI will serve as a vast data storehouse of “iris scans, photos searchable with face recognition technology, palm prints, and measures of gait and voice recordings alongside records of fingerprints, scars, and tattoos.” One component of NGI, the Universal Face Workstation, already contains some 13 million facial images, gleaned from “criminal mug shot photos” taken during the booking process. However, with major search engines having “accumulated face image databases that in their size dwarf the Earth’s population,” it’s only a matter of time before the government taps into the trove of images stored on social media and photo sharing websites such as Facebook. Last month, WPN’s Abby Johnson spoke with Face.com CEO Gil Hirsch about his company, Face.com, and the potential of facial recognition software. In her interview with Hirsch, they touched on the potential of facial recognition software being used with social media sites in such a way that it could go beyond simply identifying the person to whom the face belongs but also determining the face/person’s age, gender, and even their mood. If you a Facebook user doesn’t have their photos available for public viewing, then KLIK won’t be able to tag that person in the photo you take with the app. In other words, KLIK isn’t going to breach any of your extant security settings on Facebook. Re-Elect Obama and get Big Brother’s Internet I.D.